The final week of Season 1 has commenced, and the PURGE is approaching. If you have a youtube channel, you can receive a free Rare Supply Crate at the start of Season 2 if you re-upload this trailer! For more information, join our Discord and see the #trailer channel. Three new mini-warzones warps have been added to the Desteria world: Desert, Ice, and Forest. Each mini warzone is 8x8 chunks around its warp spawn. To claim land within two chunks of the sides of each warzone, it will cost $500,000 in-game cash to give everybody a fairer chance at getting warzone claims. At a completely random interval, between 15-45 minutes, a Dragon will summon at each of the three mini warzones and fly around dropping loot chests. Loot chests will signal a colored firework represented by its tier of loot contents: Common, Regular, Ultra, Rare, or Legendary. Loot chests can contain ranks, upgrade gems, spawners, exp bottles, in-game cash, supply crates, sell wands, trenching cores, and much more. A sudden alert in chat will appear when the Dragon Drop starts. Remember: these events are in a PvP enabled warzone and beware of traps surrounding the warzones. Traps that remove a players ability to /spawn or /home will result in removal from the server without warning. Examples of bannable traps are those that would render the player completely unable to play (i.e. : If the trapper were to log off the player would be stuck there indefinitely). You are not permitted to create/use crusher-style derps. Players who are trapped must be given a 2 block high by 1 block wide area in which they can move and defend themselves unobstructed. 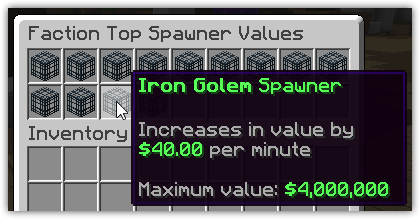 This includes drowning, suffocation, anvils, glass, gates, fences, slabs, etc. Any attempt at "loopholing" this rule (or finding a means around it) will result in punishment. You ARE permitted to trap a player with blocks OVER their head, moving a player into a confined 2 tall by 1 wide hole etc. These new items will be available from the Server Store on release and are found in loot chests at Dragon Drops. The goal of fortified walls is to enforce a cannoning speed restriction that cannot be bypassed. A fortified wall effectively becomes invincible for 3 seconds after the previous wall has been destroyed. This means that regardless of what the Raiders do with the cannon (even if they use more than 1 cannon), the wall cannot be destroyed and they cannot proceed further into the base's buffer until the 3-second cooldown on the wall has elapsed. You will see a particle effect countdown above a fortified wall. From the start of Season 2, a new tier 1 rank will be available for purchase. Details of this new rank will be on Server Store on release day. All permanent ranks, tier 1-5, will have access to a private vault. /feed and /fix will be moved down from tier 3 (Hunter) to tier 2 (Explorer), however, cooldowns are shorter for higher tier ranks. Bringing back dragon drops I see? Still waiting for some overhaul then I guess .-. Why were the overwhelmingly disappointing classes advertised in the trailer? Should of hid that **** smh. thank you citrus man, very cool! with a cool texture, i know that ******* made texture for one of their game so maby u can make a texture for the knight armor and add it something like strange and an egg of horse that spawn in pvp for 3.5 mints.